Aqua-Q will participate in Water Knowledge Europe 2018 in Brussels Nov. 28-29. Aqua-Q has been interviewed by a local radio station, https://www.tyresoradion.se/2493 for our gold award at International Water Association in Tokyo. Participated in Clean Ganga Europe Desk Conference in Brussels Sept 27. 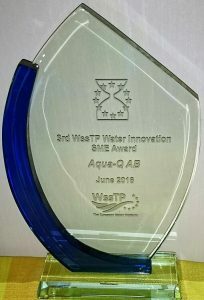 Aqua-Q will participate in IWA World Water Congress in Tokyo, Japan, Sept. 16-21 as one of the winners of the 2018 IWA Project Innovation Awards. Aqua-Q was awarded Gold price. Aqua-Q will participate in EIC Innovators’ Summit in Berlin, Germany Sept. 10-11. Participated in Water Innovation Europe in Brussels June 13-14. Participated in Water Market Europe in Brussels, Mars 21. Participated in WssTP Brokerage Event in Brussels Nov. 29-30. Aqua-Q will participate in Porto Innovation Week September 24-30 and will present AQUATRACK, early warning system for water. Final brochure for AQUATRACK® and Ozone Polishing in the R3Water project, Reuse of water in the circular economy. The full brochure can be seen at R3Water. Receives the most prestegious award National Energy Globe Award 2017 for its outstanding innovative achievement on real-time optical monitoring & sampling solution for quality control of drinking water & water for reuse & simultaneously removing pharmaceutical residues & pathogens in water by ozone polishing system. AQUATRACK® has got EU ETV ECO innovation approval for the technology real time monitoring and sampling for pathogen detection in water. AQUATRACK® is validated for 3 water matrixes; drinking water, source/lake water and treated waste water. What is EU ETV? Please see link. AQUATRACK® technology see link. Installation of AQUATRACK® at the waste water treatment plant in La Bisbal d’Empordá (Girona) Spain. Artikel_läkemedelsrester_150630. This article about removal of pharmaceutical residues is in Swedish, but please contact us for information in English. Information of AQUATRACK, MBS MultiReader for immediate detection of contaminats in water. R3 Cross Cutting Issue Workshop, Brussels. Aqua-Q’s report with title Monitoring, investigation and analysis of pathogens in MBR treated water at Hammarby Sjöstadsverk, Stockholm. IVL report C39 MBR report. Site visit at Castel d’Aro waste water plant in Spain our demo site for the R3 project. Kick-off for the EU project R3 Water, for more info klick here. Signed a Strategic Agreement of cooperation and marketing with IVL China. This agreement will help Aqua-Q to penetrate the Chineese market. Participated in a seminar Morgondagens Vattenrening arranged by IVL and Sveriges Ingenjörer and presented a paper. Participated in an international Membran Conference at CSIR at Kolkata and presented a paper. Participated in CII’s Flagship Event Green Building Congress in Chennai and presented a paper on real time monitoring of water. Aqua-Q’s project recognized as Eurostar project. Aqua-Q together with IVL Stockholm and an Israeli company, PML have been granted funding from the Eurostar program for a 2 years R&D project. The project deals with technologies from the three partners.